Sometimes it ought to be really simple for your customers. Especially for distributed electronic signatures. 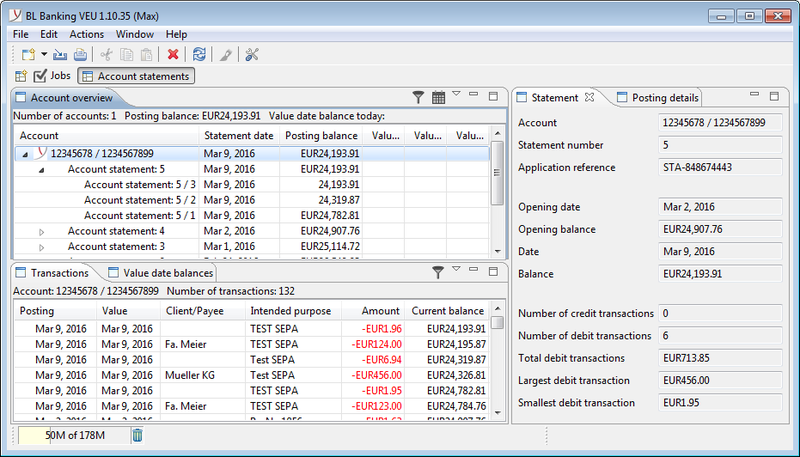 The modern EBICS client for small and large companies for DES and account statements. Thanks to a clear and well considered interface, using the program is easier than ever. With BL Banking DES you have the right tool at hand to provide electronic signatures at the workstation or using a USB stick when on the move. No matter how you want to use the software - the application offers you many options. With the BL Banking DES apps you can also access the most important functions when travelling. BL Banking DES users can also use the DES functions in free apps BL Banking for iOS and BL Banking DES for Android™ when on the move. BL Banking DES has comprehensive documentation. Just like BL Banking, the program’s big brother, the DES version also has a comprehensive help function integrated into the application. The various online help subjects of BL Banking are also helpful, e.g. the intro­duction to EBICS or our FAQ. We offer the program to credit institutions in various license packages.